A device driver is a software developed to make the hardware in computer to work. Device driver software consists of an interface for communicating with the device, through the specific computer bus or communications system that the hardware is connected to, providing commands to and receiving data from the device. In short, we can say "device driver software acts as an interface between the Hardware device and operating system"
Why should we use Device Driver update tools ? We can update each device driver from the manufacturer website manually. But it takes lot of time and we have to monitor the websites of the hardware manufacturers to keep up to date with new driver versions. By using a program to scan a computer and check the driver versions against the latest drivers can help in the maintenance of the system and we can save lot of time. What is the best practice to do when installing Device drivers from software? The best practice of installing a driver from the softwares is to always check the information the program is providing before installing any drivers on the system. RadarSysnc 2009 is a free device driver update software. It can be downloaded freely from their website. It does not require any registration to download or update drivers on the computer system. In RadarSync you can find a option to scan your computer once you install it. After scanning all components, if any updates were found, it will display a list The list contains the name of the component, the status and a link to details about the update. In the same menu there will be a button to download all driver updates. After downloading the drivers, we can see the status of Ready will be changed to install. To install click on the "install driver". RadarSync will install the selected driver. We can find the details in the windows as it displays information about the installed driver and the updated driver such as versions of both, so that it is possible to compare them before installing them. It also contains additional links and options like reporting a bad download, sending a link to a friend or downloading a different driver. 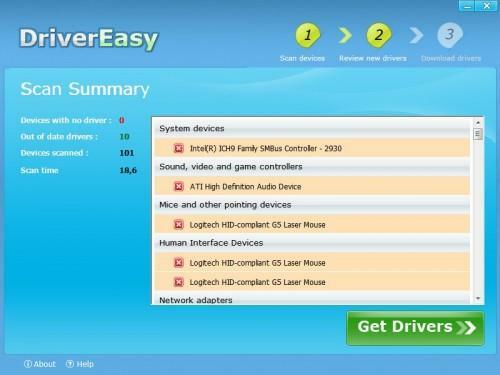 Driver Easy is one of the best software to scan and update the device driver's. The software is compatible with 32-bit and 64-bit editions of Windows XP, Windows Vista and Windows 7 operating system. After scanning the system the driver's that are not up to date is displayed in the results window. 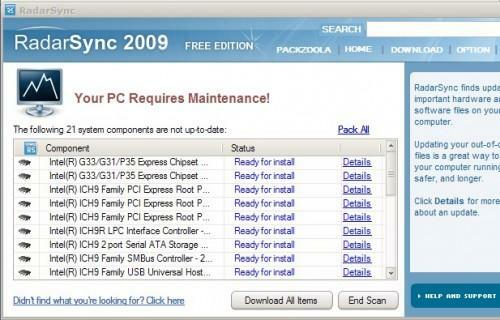 We can download and install the driver's which are out-dated. 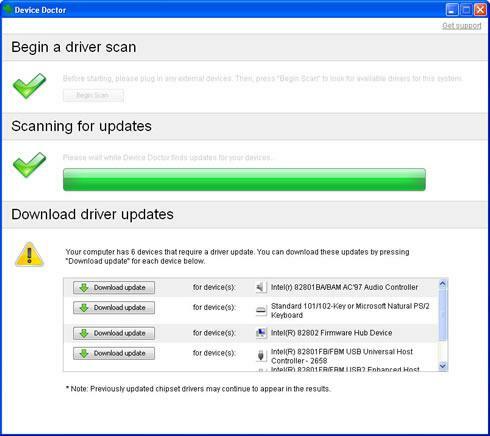 Just click on the get drivers option, device drivers will be updated. You can download from the url http://www.drivereasy.com. Device Doctor is simple and easy to use. Device Doctor scans your computer hardware and it will checks to see if there are new driver updates available for your devices. It also locates drivers for "unidentified devices" in the Windows Device Manager. It is a freeware which is available for Windows operating system. To scan, click on 'Begin Scan', it will detect your hardware, after detecting it queries manufacturer driver database of Device Doctor and immediately fetches the correct driver files for your computer. To use DriverMax first you have to create a free account in their website. After creating account, log in to the account, and you can download the driver updates that you need. They will send you email with link and activation key to download the software. The best thing with DriverMax is, you can export all your current drivers to a folder or a compressed file. It will be useful when you are re-installing your operating system. DriverMax is able to display a full report of all installed drivers. Apart from above, many other softwares are available in the internet. I have downloaded so many software to speed up my computer and they did not work so someone told to update my window 7 drivers.